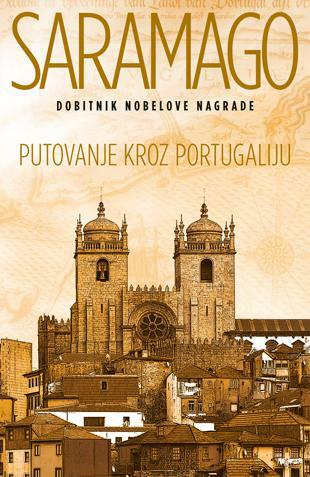 I am back to José Saramago’s Viagem a Portugal (1981), but this time I look carefully at the cover of the recently translated Serbian edition, published by Laguna (Belgrade) in 2012, within their complete collection of Saramago’s works. 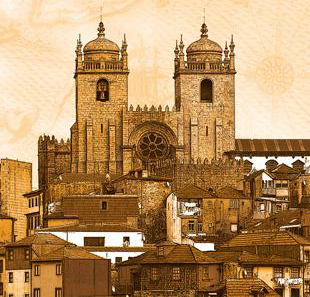 The image represents a detail of a panorama of the historical center of Porto, with the Sé – the city cathedral overlooking the downtown – as its main focus.The appearance of the image brings to mind an old drawing or etching. Seemingly, this is an old photograph done in sepia technique, which gives it a particularly poetic touch and evokes nostalgia for the times long gone. The book contains twelve other, duly credited images: Saramago’s text is accompanied with photographs commissioned from Dragoljub Zamurović, a well–known serbian artist. Strangely, there is no data about the source of the cover page photo. A closer inspection reveals an interesting detail of the cover image – the sky was replaced with a background consisting of a fragment of an ancient map of Portugal. However, the origin of the map could not be determined. The part of the map title included, though, indicates that it may be from a Dutch or Flemish source. Also, the sepia effect was used with intention to conceal the fact that the initial photo was a fragment of a contemporary urban setting. This effect made the old and the new elements of urban tissue blend better. 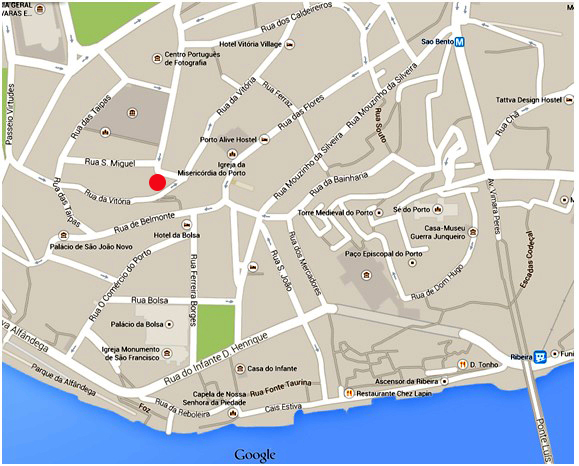 The exact spot where the panoramic photo was taken can also be determined – it is the little belvedere in Rua da Bataria da Vitória, near São Bento da Vitória monastery. I easily found an image very similar to the one actually used for the book cover through an online search. 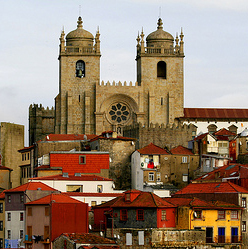 However, the panorama included contemporary structures, such as a number of residential buildings, or reconstruction of the tower next to the cathedral (work by Fernando Távora, developed between 1995 and 2002, built on the foundations of the so called Casa dos 24, I already wrote about). The contemporary structures were mostly excluded by cropping the picture. Then, artistic filters were applied using graphic software, to blend older and newer structures. The original background was replaced with an image of an ancient map of Portugal. It is even possible to determine approximately how old the image actually used for the book cover is, without particular field investigation. The following image (kindly provided by Manuel Morais, as well as the details of the location where it was taken) is from September 2007, while the above panorama that was then cropped was taken by Francisco Bernardo in November 2009. The roof of the deteriorated building next to the yellow house on the photos had already collapsed between 2007 and 2009, so the initial photo (where the roof still existed) has to be older than that period, but also more recent than 2002, when Fernando Távora’s tower was completed. Saramago, member of the Portuguese communist party since 1969, considered himself an atheist and pessimist, and was also well known as a severe critic of catholicism. However, in the introduction of the book, the writer himself emphasized that he had no intent to advise, and also that his journey was just one of the possible stories, representing both the person experiencing and the places experienced. It is his version of a journey through Portuguese culture, encompassing 588 settlements, from far north to extreme south of the country. Significance of artistic and built heritage for understanding contemporary Portuguese cultural identity was decisive to Saramago. Among the sites visited, a great number is dedicated to religious buildings and sites, being the Church powerful and dedicated to creating lasting values. Thus, the unknown designer’s choice of the cover image is not surprising, despite the writer’s political views. 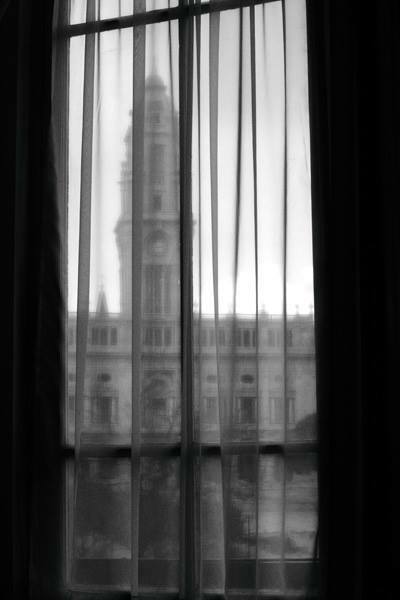 The city through its windows. My daily dose of art (and architecture) was obtained at the CPF – Portuguese Center of Photography in Porto, the place I will certainly be coming back to. 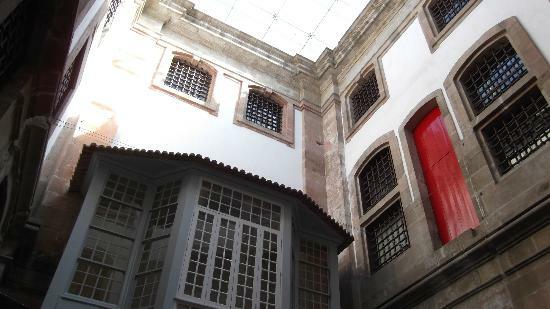 The 18th century building used to be a prison, but since 2000 it is a home to photographic exhibitions and documentation. Eduardo Souto Moura and Humberto Vieira were in charge for the adaptation project. The interior consist of just mighty stone in thick walls and cold floors, cast iron bars (it was a prison, after all) and a touch of red given by painting wooden shutters. 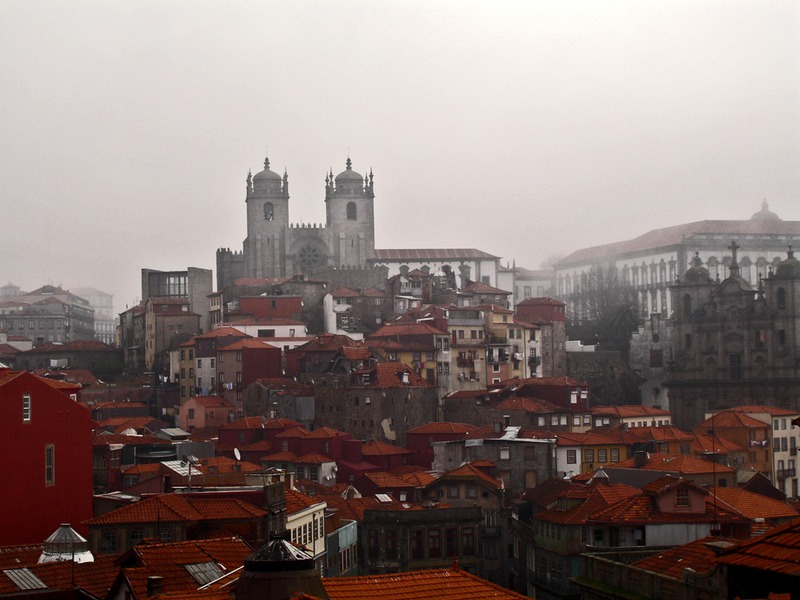 One of the current exhibitions attracted me particularly: “O Porto à janela” by Pedro Mesquita. 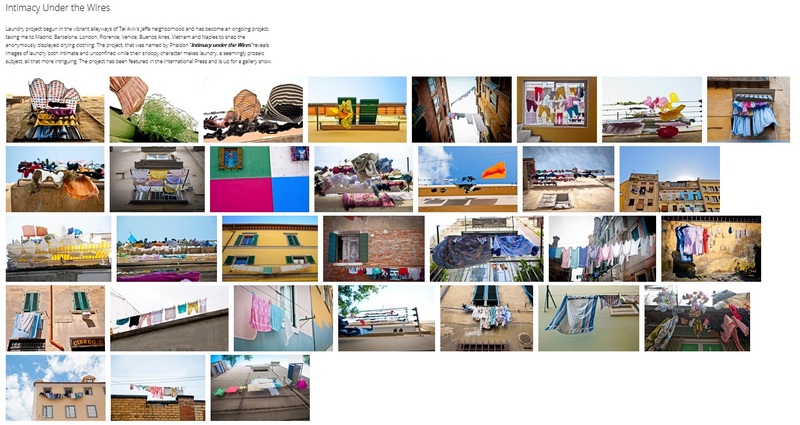 It tells so much about the city, but also about its inhabitants: to make the photos possible, the artist asked people to enter their homes and get to have the views as real people do. He was ready for all kinds of hesitation and decline of access. However, hardly anyone said no! 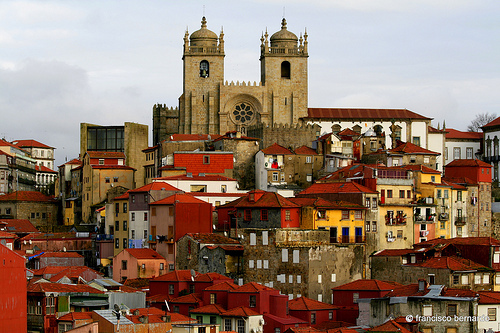 And that’s also informative of Porto and Portugal. P.S. 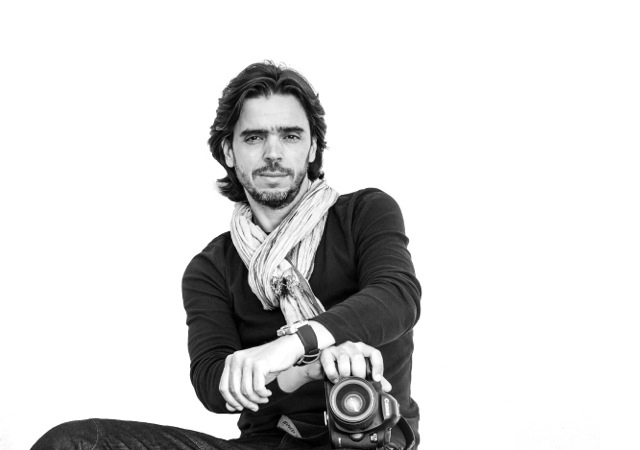 The photos are from the CPF web page; the second one is my favourite Pedro Mesquita’s work from the exhibition.